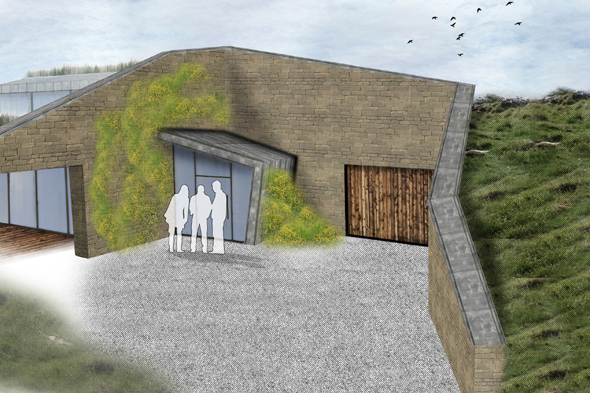 This month, Paul Testa Architecture obtained planning approval to build an earth-sheltered home in the United Kingdom. The Burrows is a highly sustainable single-family home that will be built into a hillside in South Yorkshire. Because it is built into the earth, the home will be super insulated, both in the winter and the summer, which will significantly reduce heating and cooling costs. The home will be built to Passivhaus standards (also a first for Yorkshire), and Testa is also aiming for AECB Gold standard. The Burrows house will be constructed of local stone, wood, and of course, it will have a sod roof. “The design is very simple, with a linear progression along the linear, hilltop site,” writes Testa. The home will have a southern orientation, and all of the rooms will have a southern exposure, in order to maximize natural light. However, the windows all have sun shades over them to prevent the house from overheating. “It is designed to minimise its visual and ecological impact on the site, the house combines references to the local vernacular, whilst retaining a contemporary outlook,” Testa told The Star. Construction is set to begin early next year, and the home is expected to take about one year to build. The cost of the home is ₤250,000, and Testa estimates that it will be 95 percent cheaper to run than a conventional home. Thanks for the article. It is only the first Passivhaus in SOUTH Yorkshire and is definitely not the first earth-sheltered house in the county or the first earth sheltered Passivhaus.